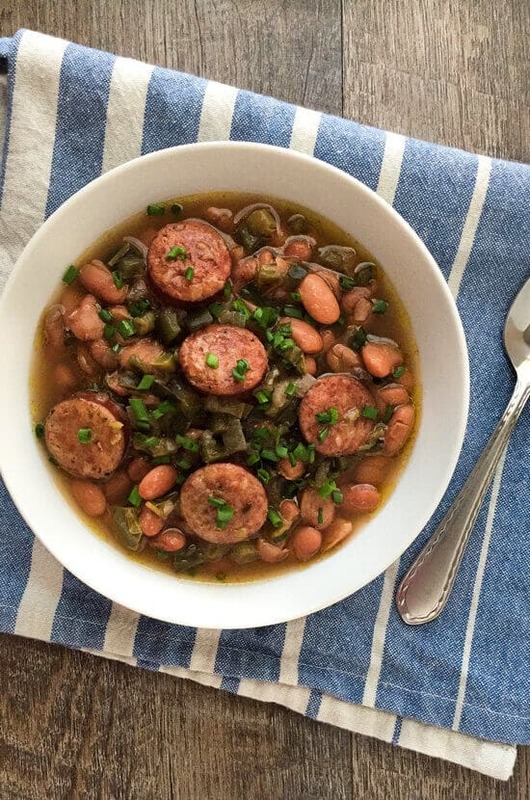 These Slow Cooker Pinto Beans with Sausage are pure comfort food. Made with onions, peppers and smoked sausage, it’s super flavorful and delicious! Hey guys! Hope you had a great weekend! I sure did hate losing an hour. Who else is still feeling a bit groggy? While I don’t enjoy that part of daylight savings, I do LOVE having more hours of daylight! What about you? Love or hate daylight savings? If you have a super busy week ahead, then this Pinto Beans with Sausage recipe is just what you need. The slow cooker does all the work. All you have to do is chop and drop! And, if you prep everything the night before, then you can just toss it in the crockpot in the morning and turn it on. And you get to come home to a delicious comfort food meal! How’s that for easy? I used a package of organic smoked sausage from Pederson’s for my dish. The organic version doesn’t seem to be readily available here in our area, which is a bummer. So far, I’ve only found it at our local butcher shop. Most supermarkets here only carry their natural sausage products, which I do occasionally use. If your budget allows, try to find a good brand of organic smoked sausage. One of my favorite things about cooking pinto beans in the slow cooker is the thick, delicious broth that you get. You know what would make this even better? A nice big slice of Skillet Cornbread. 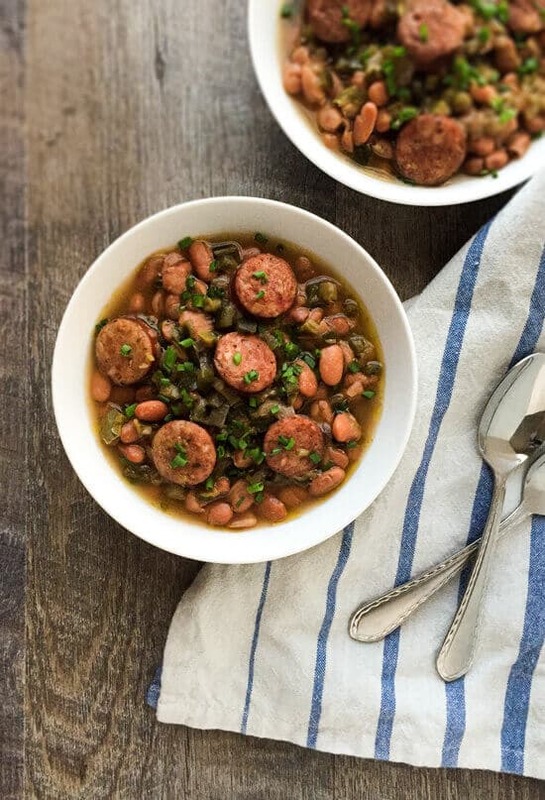 Make up a pan of that and serve it with these Slow Cooker Pinto Beans with Sausage for an even tastier meal! 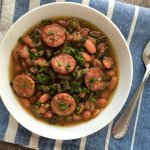 Slow Cooker Pinto Beans with Sausage - made with peppers, onions and smoked sausage, these are truly flavorful and delicious. A total comfort food meal! The night before you plan to make the beans, place into a large bowl, add water to cover by at least an inch over the beans. Let soak overnight or for at least 8 hours. Drain and rinse before adding to the slow cooker. Place all the ingredients but the salt into the slow cooker, cover and let cook for 8-10 hours on low or 4-5 hours on high. When beans are tender, taste, add salt, then serve. Can this recipe be doubled if I use a 8 quart crockpot? Why the chicken stock instead of beef ? I’ve never tested doubling the recipe, but I don’t see why you couldn’t. Cook times might be different. As for the chicken stock, that’s just what I tend to keep on hand the most. Beef stock would certainly be fine.